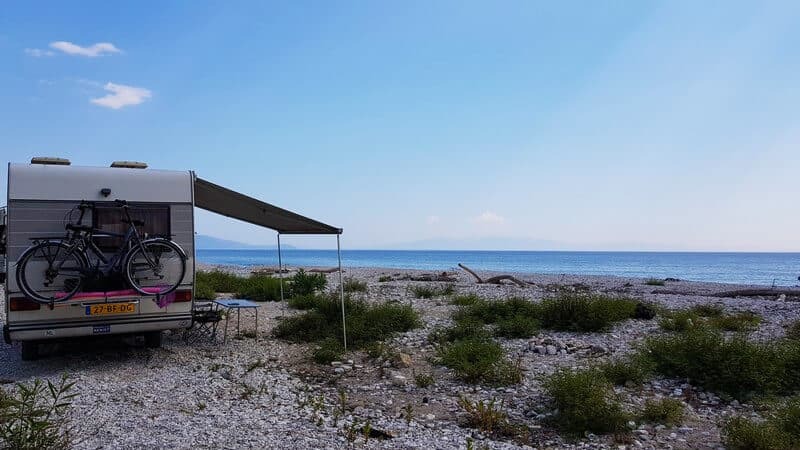 The whole idea of traveling through the Balkans in a campervan originated from a photograph I saw of Ksamil beach that a friend posted on Facebook. The stunning blue crystal clear water was something I had to see for myself and reaching Ksamil was the basis on which our route took shape, starting in Slovenia and traveling to Albania. So our European Adventure began, all because of Albania. 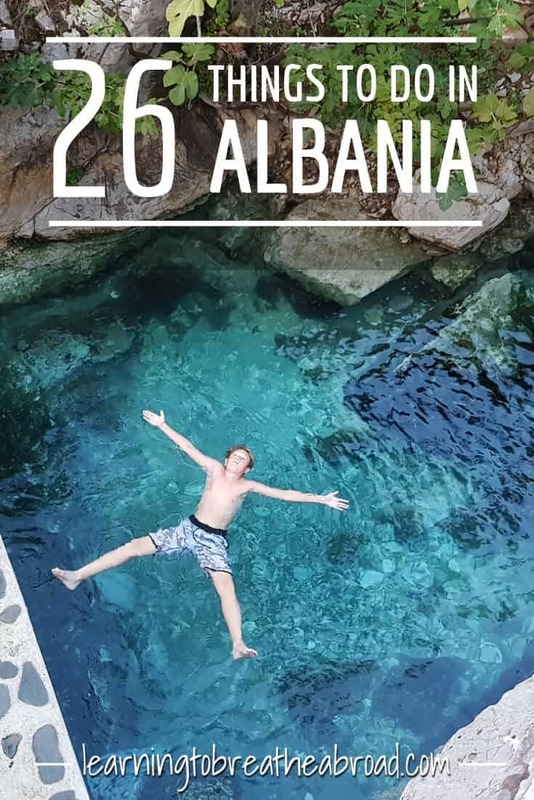 The more I researched things to do in Albania, the more I couldn’t wait to travel in Albania, and this amazing country did not disappoint! We fell in love with Albania almost the instant we arrived. 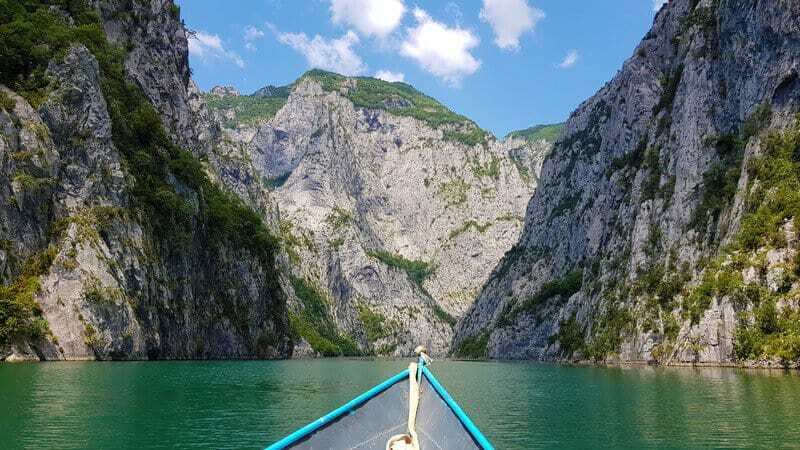 We were bowled over by the hospitality of the people, the absolutely delicious traditional food, the incredible beauty of the Albanian Alps, the charm of ancient UNESCO towns, turquoise rivers, hot springs and the breathtaking Albanian Riviera. But most of all we loved the freedom we felt here. The ability to park right on a beach and wake up to the stunning sea, knowing we were safe as houses – even with our windows open all night! 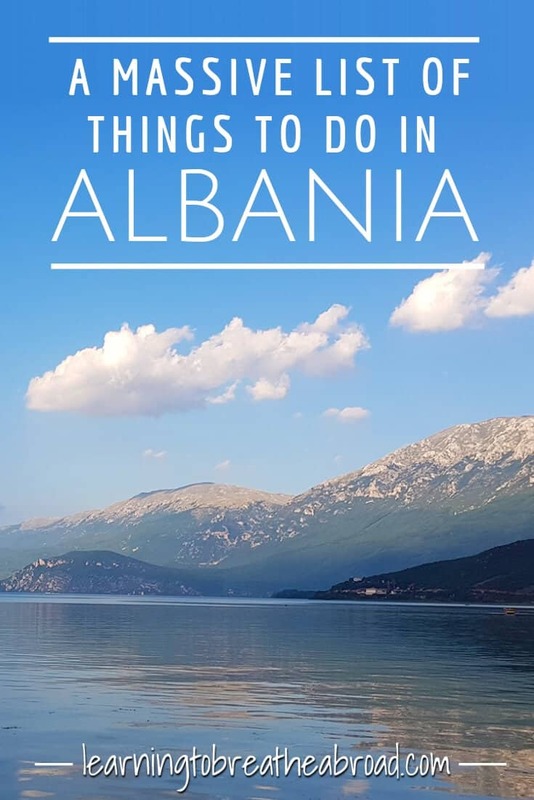 Our 5 weeks in Albania were filled with some really wonderful experiences and hopefully, this travel guide will give you a taste of all the awesome things we did in Albania. After a month in Montenegro, we were finally on our way to Albania. We’d had a few issues with visas at other border crossings, but were fully prepared this time with all the correct documents, written in the Albanian language, to assist us. Leaving Montenegro I slowed at the customs booth and handed our passports out of the window. The official took one look at our Dutch number plate and just waved us on. Traveling on a South African passport is not easy, so to be waved through a border crossing was joyous, but it wasn’t long until the worry set in. On entering Montenegro, our passports had been stamped and we were given 90 days. Now we were leaving but we had no exit stamp? I wasn’t sure if that would be a problem, but I guessed that the entry stamps into Albania would be enough so, on we continued. And one we drove and on we drove, but there was no Albanian border post? In fact, we never reached an Albanian border post and later came to realise that the border post we had just been through was combined for both exit from Montenegro and entry into Albania. We were now in Albania, but according to our passports, we were still in Montenegro. It really was our easiest border crossing ever, but it did leave me with an uneasy feeling! When we crossed the border from Albania to Macedonia, I had my heart in my mouth. The official asked the date of our arrival in Albania made a note in my passport, and that was that. So easy peasy! Within a few minutes of crossing the border from Montenegro, we saw this huge Rozafa Castle on the top of the hill in front of us. Disregarding Siri’s instructions, we veered left and headed up the hill to explore. This was to be our first stop in Albania and we couldn’t wait. We drove as far as we could with Miles McFlattery, our campervan, and then walked the rest of the way up the very very very steep hill! We paid the entrance fee of €1.50 and walked through the huge arched entrance, only to find ourselves completely surrounded by immense fortified walls and vast rolling lawns. The views of the town of Shkoder and Lake Shkoder from so high up were stunning and we were instantly in love with Albania. I am by no means a vegetarian. I tried giving up meat for a whole year but it wasn’t for me. That being said, I could easily have become vegetarian with the delicious traditional Albanian fare. The main vegetables you’ll find are peppers, aubergines, baby marrows, tomatoes, cucumbers and olives. 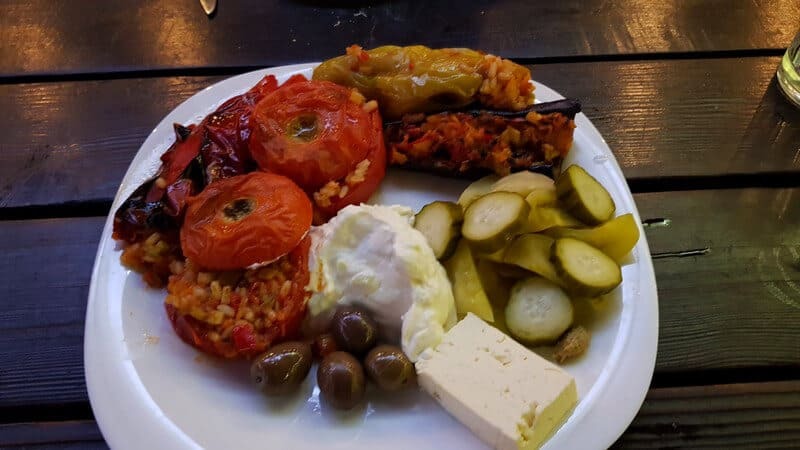 These are served in a myriad of ways from roasted to pickled, covered in feta cheese or stuffed with rice, mixed in with local yoghurt or served as a spread known as Ajvar. The local specialty is kajmak, a cross between clotted cream and cream cheese which is too delicious for words with roasted veg. 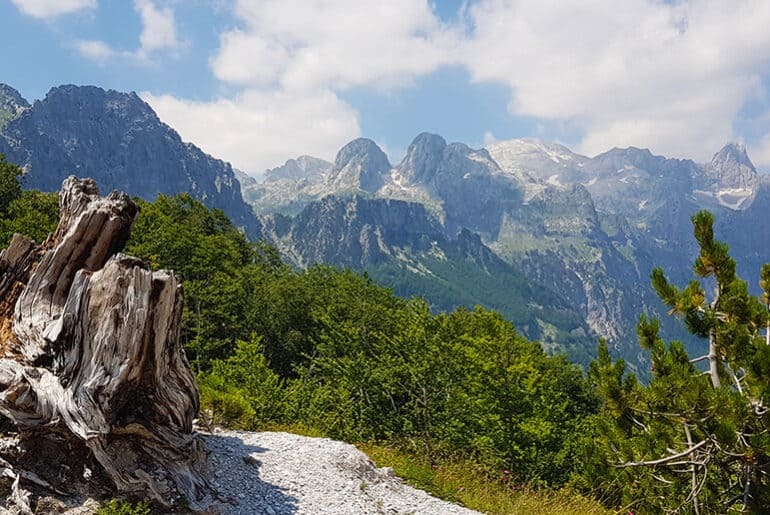 The hike we did from the Valbone to Thethi, over the Albanian Alps, has to be one of the highlights of our entire Balkans trip. 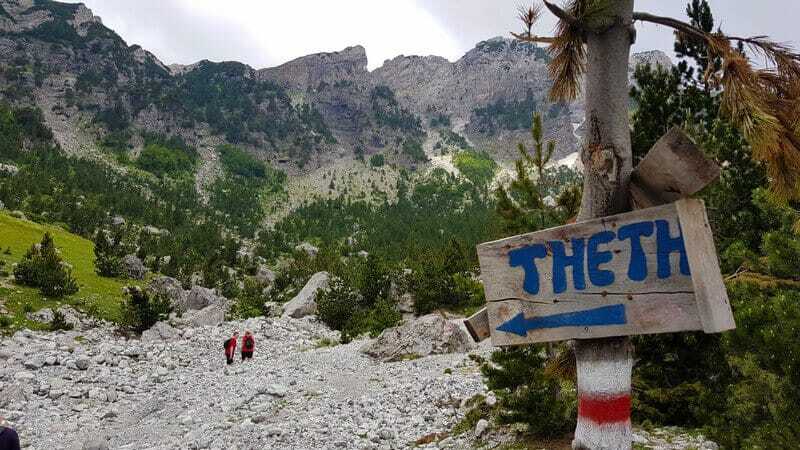 It is a grueling 8-hour hike that starts in the rocky riverbed of the Valbone Valley and takes up through green forested meadows until you reach the craggy rockfaces at the top of the pass. Here you have to stop, firstly to catch your breath but more importantly, to drink in the most phenomenal views you’ll ever see. The majesty of these mountains is breathtaking and if you climb a little way up from the pass, you’ll be rewarded with a full 360° view of the Valbone and the Thethi Valleys. This is nature showing off in all its glory! You can read our full post on the Valbone to Thethi Hike here. Lake Komani is a man-made lake created by joining two dams, one in Fierze and one in Koman. The result is one of the most breathtaking scenes in Europe. The daily ferry takes you from Koman to Fierza, navigating through vertical canyon walls that dive deep down into the aquamarine waters. The boat trip takes about 3hrs and can be done in the small narrow passenger-only ferry or the big ferry that can take cars as well. The ferry service was originally intended for locals whose only means of accessing their homes was by boat, but over time the ferry has become popular with tourists doing the Valbone to Thethi hike or just wanted a glimpse of this beautiful scenery. Goat herders and shepherds abound in this rustic land. The upside is the wonderful organic milk, cheese, cream and yoghurts available everywhere. 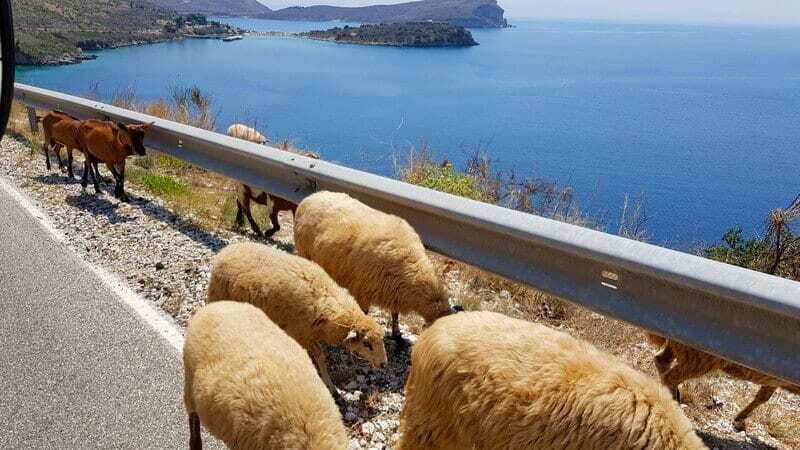 The downside is that the roads are frequently congested with flocks of sheep, herds of goats, cows, donkeys and even pigs. Taking it slow on the roads is a must and it is highly advisable not to drive in the dark. The structure was opened in Tirana in 1998 as the Enver Hoxha Museum to showcase the legacy of Enver Hoxha, the Communist Leader at the time. He ruled the country with an iron fist for nearly half-a-century, so when the communist regime fell in 1991, it ceased to function as a museum. It has since been used as a conference centre, a base for NATO during the Kosovo War, a broadcasting centre and a bus station. 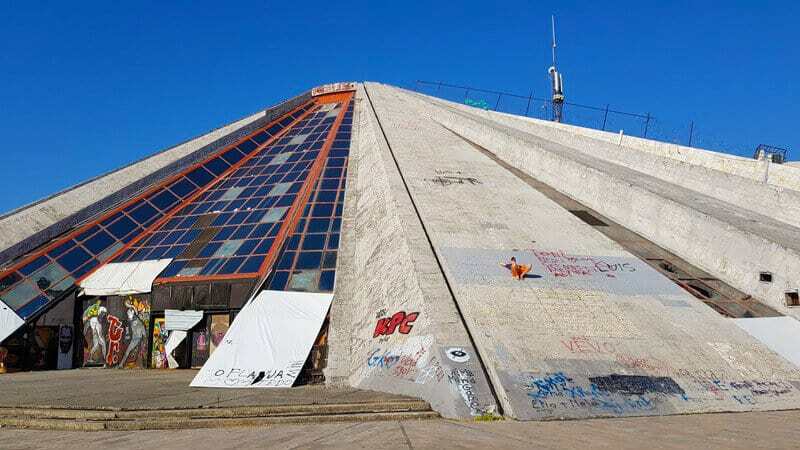 Despite its state of total disrepair, a citywide petition has guaranteed that it will not be demolished and plans are afoot for it to be refurbished into a technology centre for kids. For now, it is photographed by tourists and used by thrill seekers to see how far up they can climb – can you see Tai halfway up? How we managed to keep one long enough to take a photo I have no idea! Trilece, meaning three kinds of milk, has to be one THE most delicious desserts I’ve ever had the pleasure of eating. At times I felt like we were on a Trilece pilgrimage, charting our route through Albania on the basis of where we could find our next trilece. 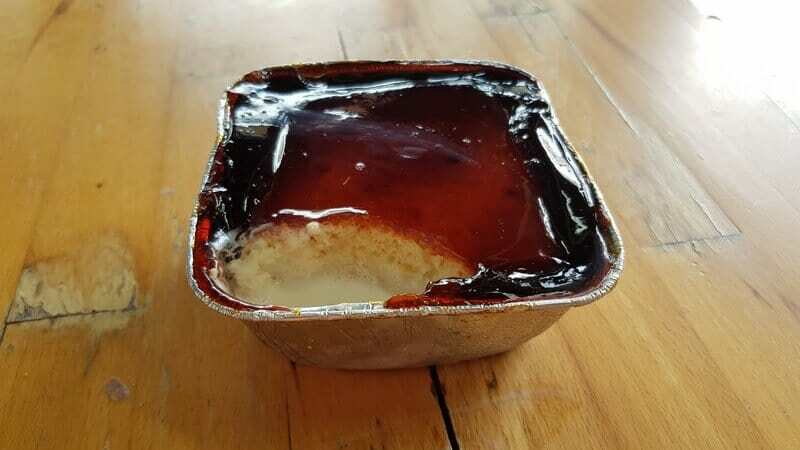 A soft spongy cake drenched in sweet creamy milk and topped with caramel – you’ll think you’ve died and gone to heaven! Xhiro is the Albanian term for a nightly walk. 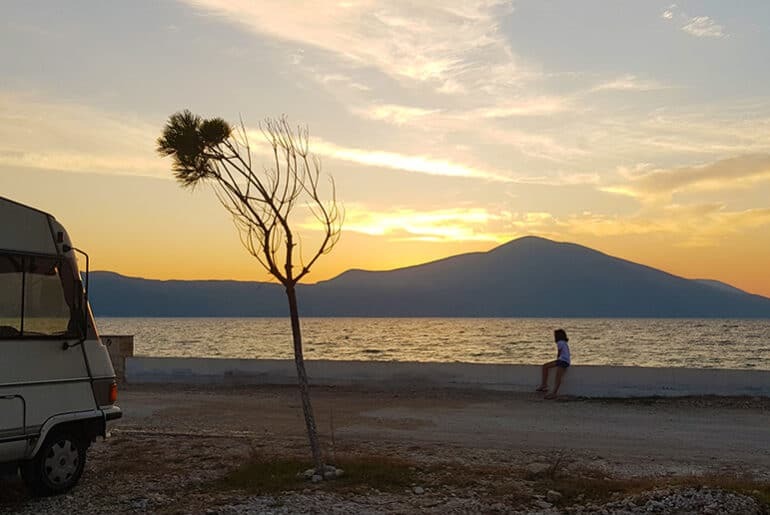 You’ll find Albanians everywhere taking a stroll as the sun goes down. 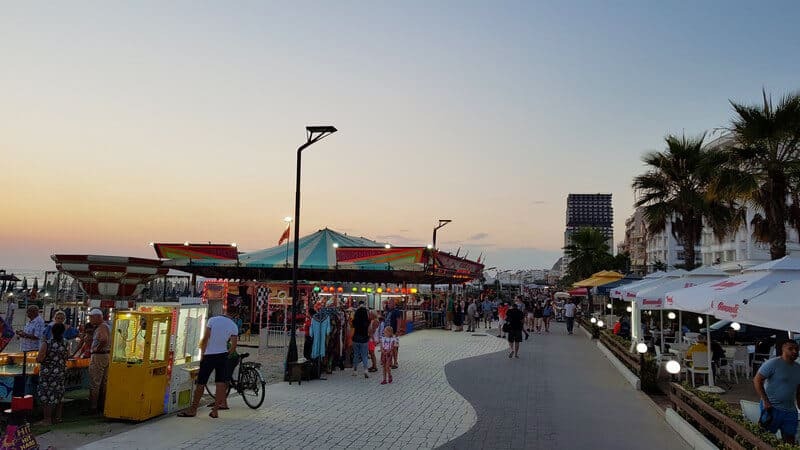 Seafront promenades suddenly come to life with bumper cars, pop up stalls and candy floss sellers. This is the time to be seen, so get out there and strut your stuff with the best of them! 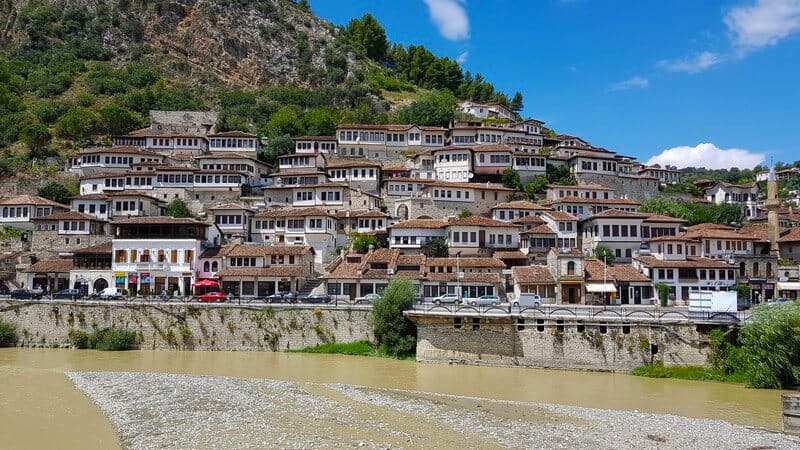 Berat is named the “City of a Thousand Windows” and a quick glance at the image above will show you exactly why. There was a crazy maze of narrow zigzagging alleyways and Ottoman style houses in the old town, while the new part of town had a wide pedestrianised boulevard that was virtually empty. The castle on top of the hill is huge and an entire neighbourhood contained within the fortified walls. The houses in this neighbourhood are still occupied and it is here that you will find guesthouses in which to spend the night. 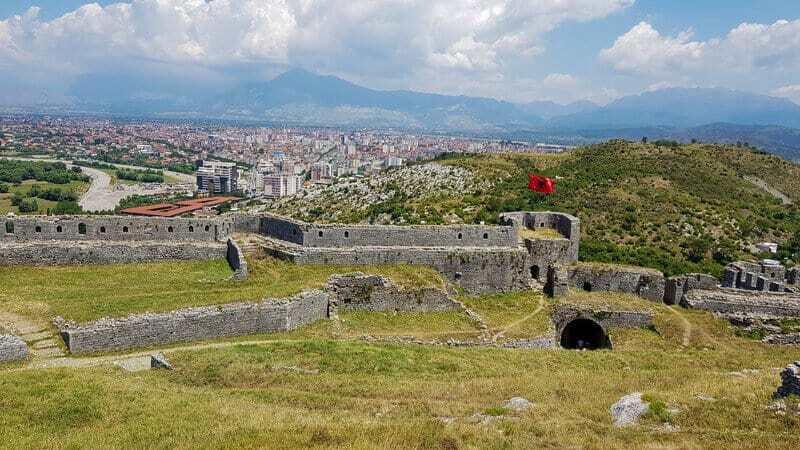 You can also see Berat as a day tour from Tirana. If you’re looking for somewhere completely off the beaten track then the Narte Nature Park is the place to go. A narrow spit of land separates the Narte lagoon from the sea. 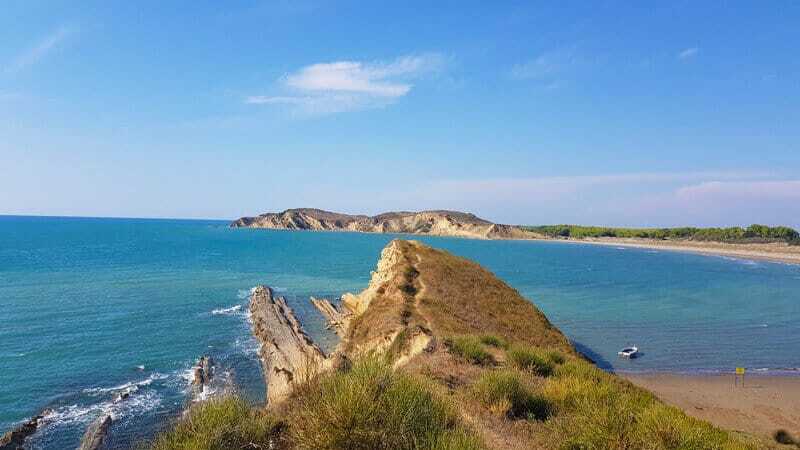 It is at these cliffs that the Ionian and Adriatic Seas meet. Wild birds abound and a huge flock of flamingos takes to the air every now and again as they make their way around the lake to feed in the shallow waters. The road is pretty bad, but we made it without a worry in Miles McFlattery and the 2km of bumpy dirt track was so worth it for the remoteness and beauty of this spot. We wild camped here with not another soul around and picked blackberries for breakfast from the bushes around us. There is a wooden jetty from the hamlet of Zvernec across to the island in the middle of the lagoon. There is nothing better to do on holiday than sit beside the sea, eating fresh seafood and drinking an ice cold beer. 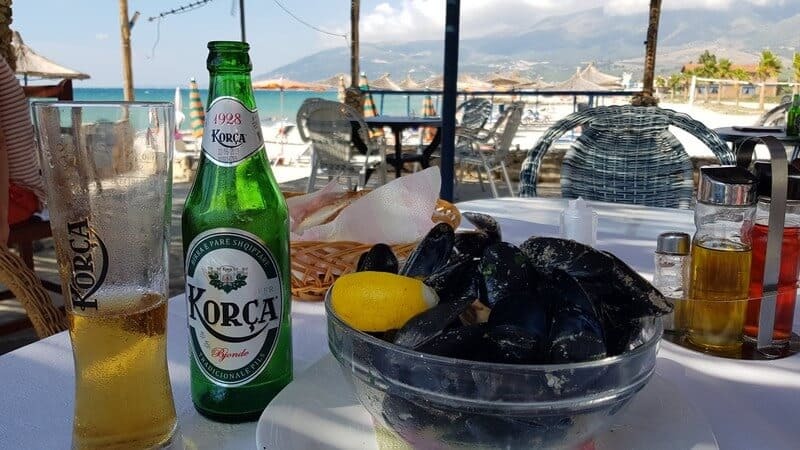 We ate lots of seafood everywhere along the Albanian Riviera. Seafood risottos, deep fried calamari tentacles, fresh grilled fish and at Hotel Alba-Gert in Orikum we scooped up this bowl of mussels and a beer for the price of €6.50! Now that’s a win in my book! The Llagora Pass is listed as one of the World’s Most Dangerous Roads. From the town of Orikum, the road going up is narrow, old and worn with potholes and patchy tarmac. Google maps showed a crazy zigzagging road, but I had no idea what was really ahead of me. The incline was pretty steep and the hairpin bends were narrow, so when faced with huge buses on their way down, I have to admit it was rather scary. Just our luck the roads were super busy, but we made it past the last bend at the top and then everything flattened out through the Llagora National Park. Bungalows, hotels and restaurants dotted this forested stretch with signs for various hikes and other outdoor adventures. As we came out of the forest the land became barren and rocky and we could see the road snaking its way all the way down to the coast. The road on the southern side of the pass was almost brand new. A beautiful wide asphalt road took us down, down, down at a steady incline for a very long 8km’s. We stopped often as the views were stunning and to give our brakes and clutch a break. The last thing I needed was for one of those to go on this massive descent. A few weeks later we drove over the pass in the opposite direction and I’m not sure if I just knew what was coming, but it definitely wasn’t nearly as scary, so if you have the option, perhaps try driving south to north instead of the other way. The seaside town of Dhermi perches on cliffs overlooking small, idyllic bays. 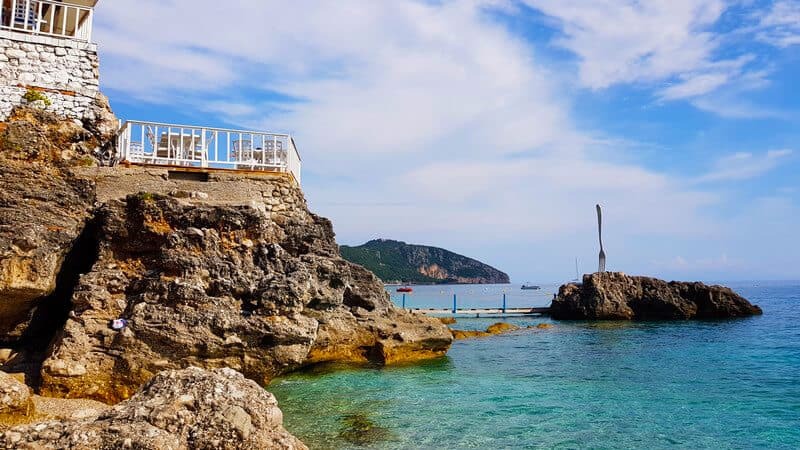 The numerous restaurants overlooking these small beaches have possibly got the best views in the world and yet you can dine out for a fraction of the price. Dhermi is set on a steep hill, so staying close to the beach is important. The Mehilli Hotel and Apartment Sea Side both have great locations at a reasonable price. Throughout the Balkans, you will find borek. In fact, if you’re a budget traveler it could possibly constitute the majority of your meals as it is super cheap at a crazy 0.50 Lek = €0.004! These flaky pastry pies come with a choice of fillings: meat, spinach or cheese. The cafe at Borsh Beach also had a roasted tomato version which was yum, yum, yum! 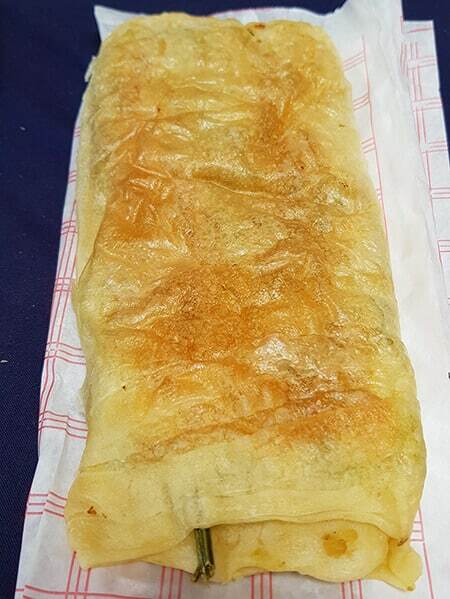 We ate borek for breakfast, lunch, supper or as a snack. Seriously… have you ever seen water like this? 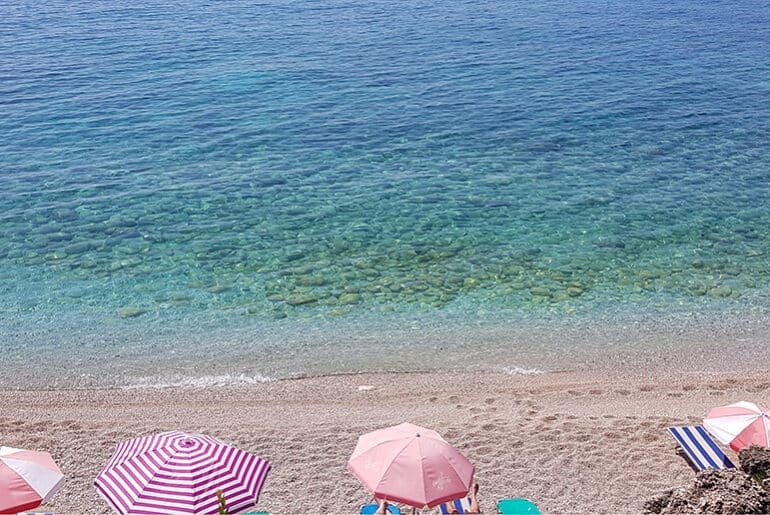 Albania beaches are some of the best in the world! It was absolutely heavenly and would have been perfect for snorkeling – had there been anything to see in the water! The pebbles could be a bit tough on the old feet, but I bought a cheap pair of swimming shoes with a rubber sole that worked like a bomb and are well worth the few Euros you might spend. 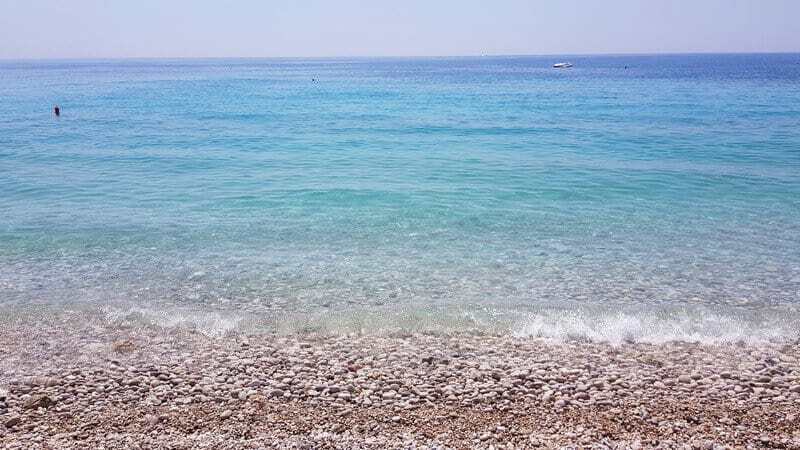 The stretch of coastline from Saranda to Vlores is just one exquisite beach after another. You’ll drive along winding roads and through tiny villages, one minute you’ll be high up on the mountain and next moment alongside the sea. This is no place to be in a rush. Take your time. Stop often. We tried to swim at every beach we found and would climb back into the campervan still dripping wet, in our swimming costumes and off we’d drive to the next spot, happily waving at all the other campervans we passed. There is a camaraderie amongst the campervan community which creates much waving and flashing of lights when passing each other on the road. This gargantuan effort is merely to say hello and to let you know that there are others out there having the same incredible experience as yourself. We are a team and it always puts a big smile on my face knowing I’m not alone in this crazy journey of ours. Port Palermo is a small beach on the narrow spit of land between the mainland and a little island. 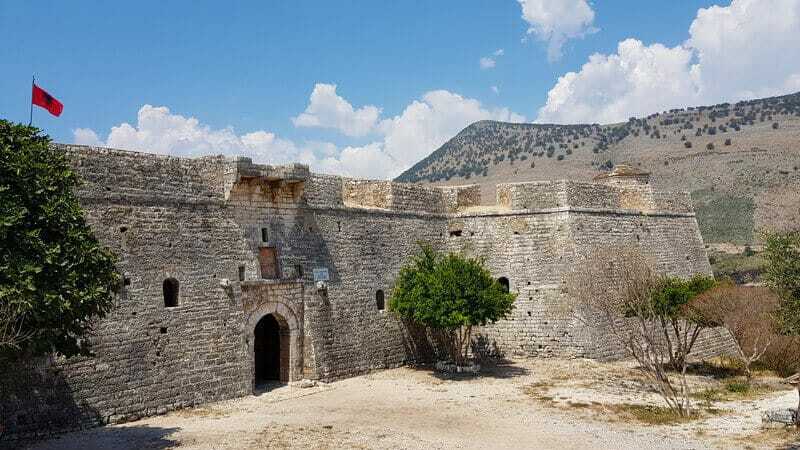 A single restaurant and a dilapidated church are all that you will find, apart from with Ali Pasha’s Castle on the island. We wandered up the hill to the imposing walls, paid the entrance fee of 100Lek (€0.80) and entered one of the most enchanting castles we’d been in. The rooms had numerous columns with vaulted ceilings and unlike the large barren rooms of other castles we’d seen, this one was small and it was easier to imagine people living here during medieval times. Climbing up a staircase brought us onto the roof where we had 360° views across the sea and to the mainland. Wild camping is legal in Albania and we found it an incredibly safe country, so had no worries about wild camping wherever we wanted. We spent a large part of our time camping right on the beach. In fact, if Miles McFlattery had 4WD, then I would have parked right on the sand! There is nothing more wonderful than waking up, pulling on a bikini, stepping out of your door and being right on the beach. Butrint was the first place in Albania to be included as a UNESCO World Heritage site. 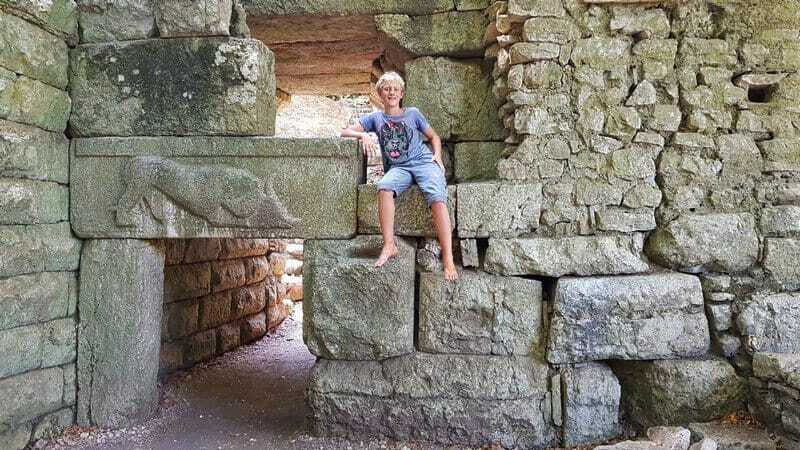 This sprawling archeological site was inhabited over a span of 2500 years by the Greeks, the Romans, a bishopric, it was under Byzantine administration and then the Venetians. It will take a minimum of 2 hours to walk the site and during that time you will see evidence of all the time periods during which it has existed. Some elements have been incredibly preserved, while some structures are only recognisable by their foundations. It is an incredible look back in time and to imagine that some of these structures have been here since the 8th Century is mind-blowing. Syri I Kalter or the Blue Eye is one of the worlds most fascinating natural phenomenon. Bubbling forth from a depth of more than 50m, this water spring pushes out an incredible 18500 liters of water per second! There are signs everywhere stating that jumping is not allowed, but no one seems to take any notice and we watched numerous people brave the icy 10° water to jump right into the center of the eye. No sooner had they brushed the surface of the water than they were sent floating off downstream by the immense strength of the current. 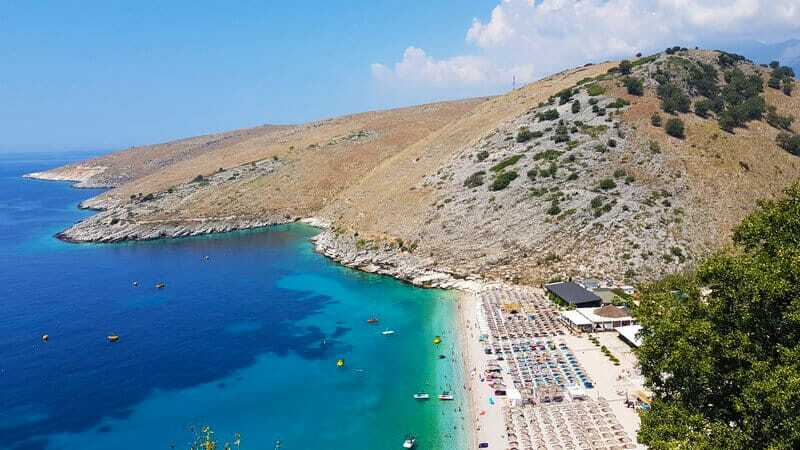 Being an easy day trip from Saranda, the Blue Eye was teeming with tourists which made it a rather unpleasant experience. My top tip is to get there super early before the crowds. Albania’s most famous author, Ismail Kadare named it “the steepest town in the world” and after a day of wandering the maze of cobbled alleyways, your legs will know all about it! The ancient town of Gjirokaster has been named a UNESCO World Heritage Site due to its historic Ottoman-era architecture, unique slated roofs and the magnificent Gjirokaster Castle overlooking the town. 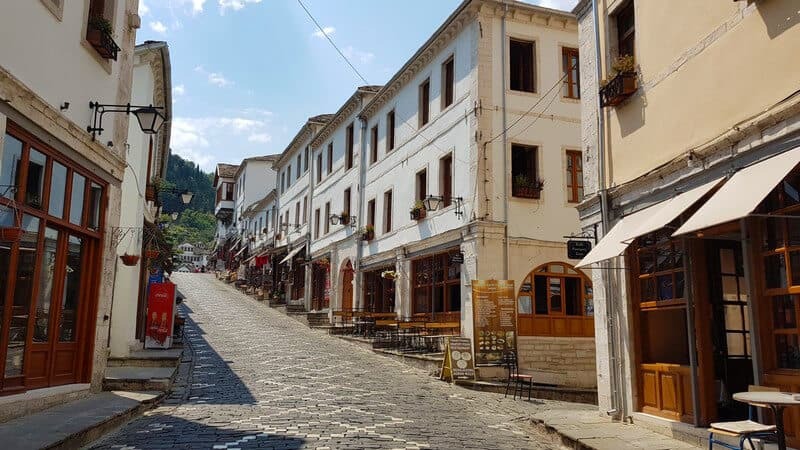 Interestingly enough, Gjirokaster is the birthplace of communist leader Enver Hoxha, but there are no memorials to be found of him anywhere here. From Girokaster, follow the turquoise Vjosa River as it wends its way through the mountainous landscape. Just 15km past the town of Permet, take a left turn and follow the narrow road to the start of the Langarica Canyon. Here you’ll find an arched bridge spanning the blue-green river, a relic from the Ottoman Empire that has carried countless people to the thermal pools on the other side. There are two main pools at the base of the bridge, but these can get quite busy in summer. If you’re wanting a bit more peace there are a few more pools further up in the canyon. 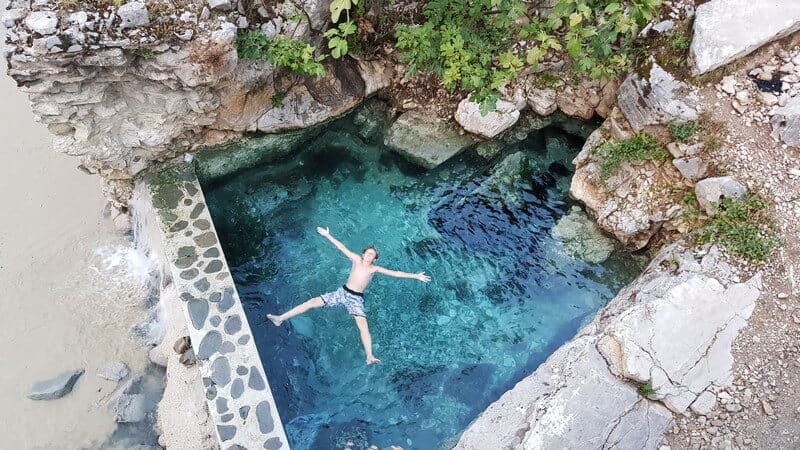 The sulphuric waters are particularly beneficial for curing gastric and rheumatic diseases and covering your face and body in the black mud will leave your skin feeling like a baby’s bottom! Sometimes the experience is not in where you are going, but how you get there. 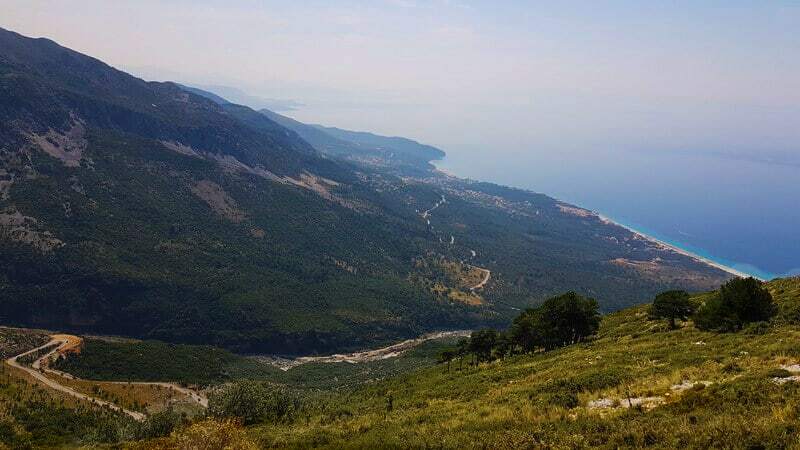 Albania has so many vastly different landscapes, from the Accursed Mountains in the north to the twinkling blue sea of the coast, from hillsides covered in hundred-year-old olive trees to fields of wheat. Wherever you may be, take the time to enjoy where you are and what is flying past your window. 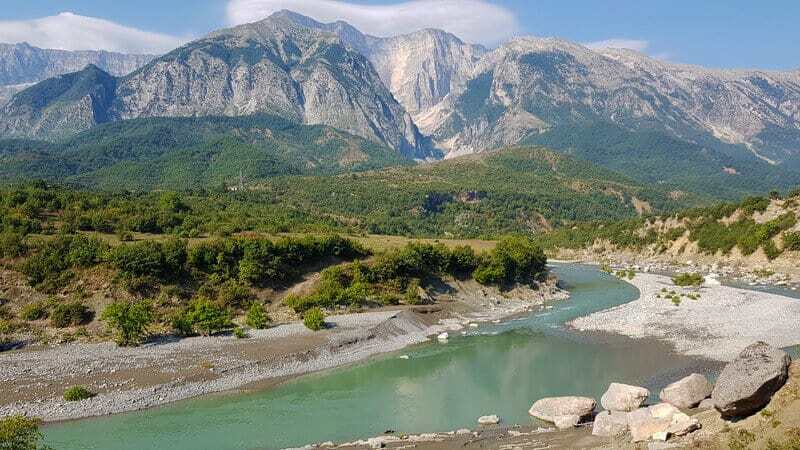 The image above is of the turquoise Vjosa River taken during an epic road trip from Saranda to Korce. It is estimated that there are close on 750 000 bunkers dotting the landscape of Albania. 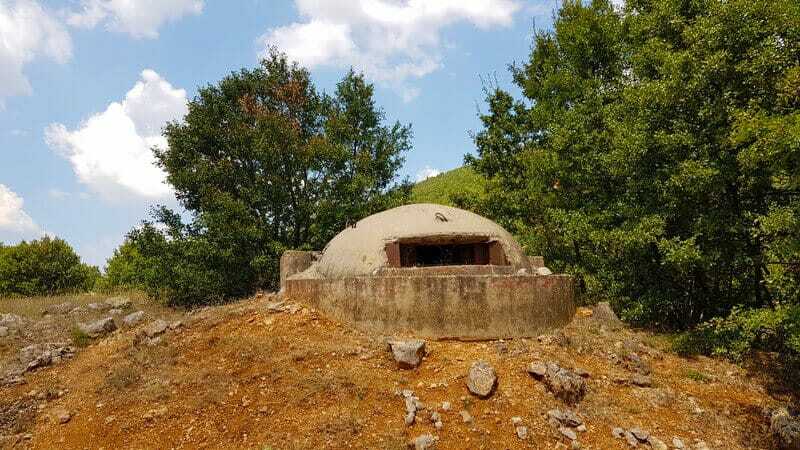 A relic of a torrid and fearful time when Albania’s paranoid Communist leader, Enver Hoxha, commissioned the building of all these bunkers. The intention was to provide each family with a bunker and a rifle to protect them from invading enemies. We found bunkers on beaches, in fields, on mountains, and at schools. Most have been left in a state of disrepair but some innovative folk have turned them into bars, accommodation or painted them as ladybugs. 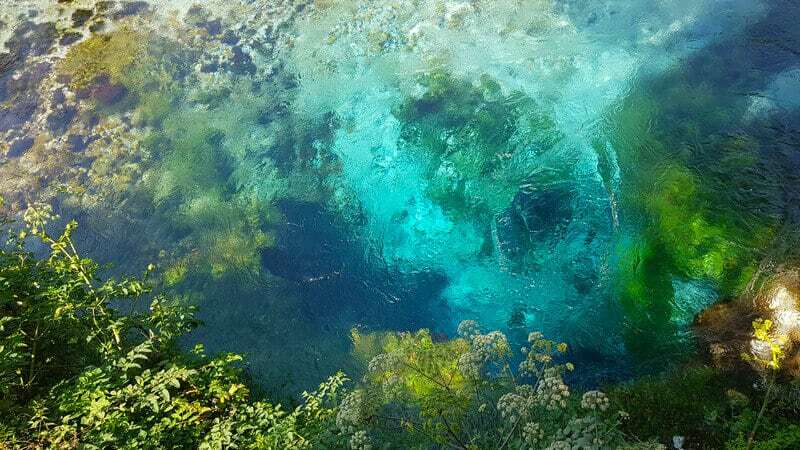 On the shore of Lake Ohrid lies another natural spring, the Drilon Spring. Set in a tranquil garden with swans, ducks and weeping willows, one can’t help but want to lie down on the perfectly trimmed lawn and enjoy the peace. A wooden bridge festively adorned with colourful flowers takes you to the central island which has a number of restaurants. While you’re here, hire a pink rowboat for a gentle paddle around the island. 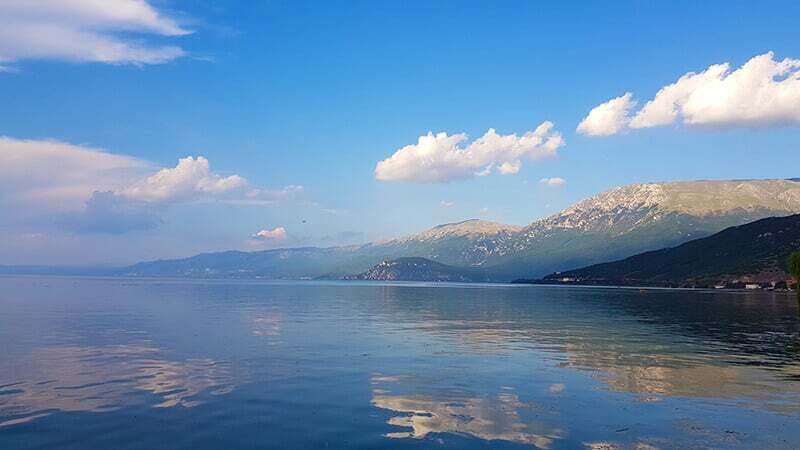 The city of Pogradec lies on the Lake Ohrid, a 2-4 million-year-old lake under UNESCO protection due to its unique value. Numerous beaches line the shore and sunbeds and inflatables abound. It is peaceful here and the perfect place to unwind after a busy travel schedule. We recommend Hotel Pogradeci which is located right on the shore of Lake Ohrid in the heart of Pogradec town. It offers big balconies and a private beach with sun loungers. 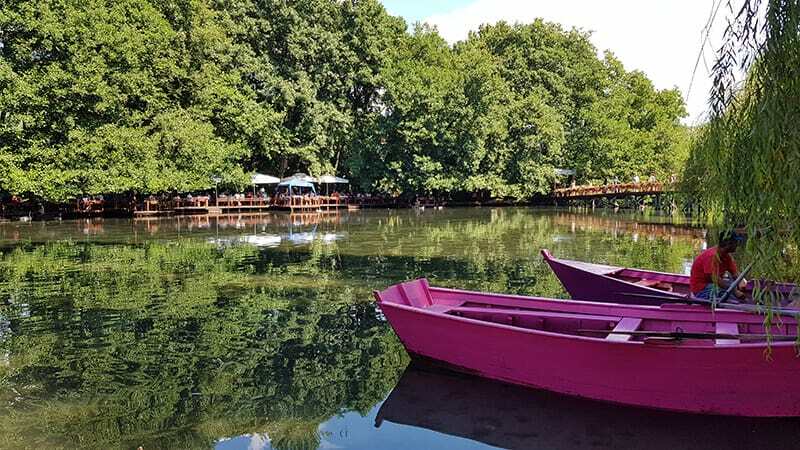 You can also take a 5-minute drive from the city centre in the town of Tushemisht and located at the Drilon Spring is Vila Dante Boutique Hotel. Albania is an incredible country. The scenery spectacular, the beaches are stunning and the people are unbelievably hospitable and friendly. Virtually everyone we met could speak English which was a huge help. Despite the bad reputation Albania has about being gangsters, we found it one of the safest place to travel. Not once did I feel threatened or uncomfortable. We loved Albania and hope you will as well? Have you been to Albania? Did you also feel safe? I’d love to hear from you!